Hello Dinerians, or is it Dinerieses? No, Dinerians sounds a lot better, anyway I digress. According to google analytics 25% of Dineries users are visiting us on a mobile device. Up until now we have not made any attempt at making the site mobile friendly. The biggest issue was with our "BIGGER" menu display. We built this menu displaying system to make it easy for our users, maximizing your monitor space if the menu was big. There are also some cool easter eggs we built in like using the arrow keys and mouse scroll to pan the menu. Maybe you noticed, maybe you didn't but you used it anyway. But 25% of users were getting a crappier experience because of this! The menu images were getting cut off. After some angry emails from users we finally did a quick fix to just load the image regularly and allow the mobile touch interface to play beautifully into displaying the menus. 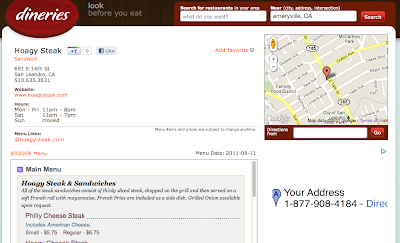 Now you can view the full menu and zoom and pan as you would want on a mobile device! Not a complete mobile site yet, but now it's very usable. Here's some screenies. Despite how cool Dineries looks, we are actually a very small group of people all with full time jobs. Such so, we really need the help of our Dinerians to help out on the site to maintain the site. So order to build and maintain the restaurants, we have and plan on continue to build out features for you Dinerians to submit information to us. So here we go! The long awaited editing existing restaurants and submitting of new restaurants. 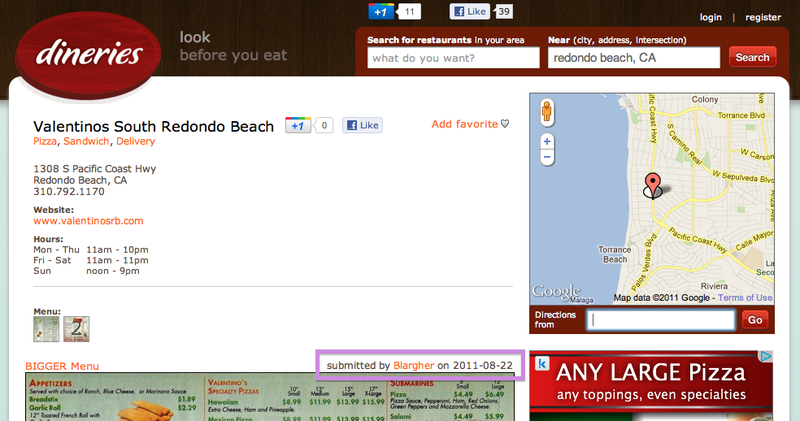 Now on existing restaurants you will see this new link. 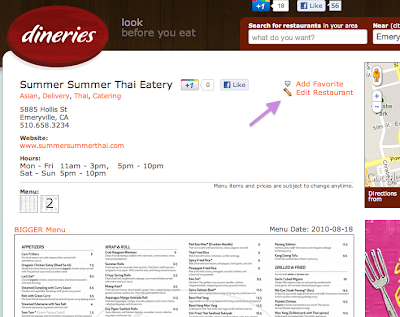 To submit a new restaurant to us, use the link found in our updated footer called "Submit Restaurant"
We recently came across the service OpenMenu at openmenu.com. They have standardized a menu format which many restaurants are using. There is a lot of work to be desired in this area of menus and they have a great start. What this means to us, is more menus online, which we have embedded from openmenu! Dineries have upgraded the underlying CSS framework making use of Bootstrap from Twitter. What does that mean? Basically you'll see a more unified look, pretty buttons, and prettier message boxes. All in all, not much has changed on the user side, but things are considerably different and hopefully will speed up development for the future. The restaurant business along with just about any other business has been expanding it's presence on the internet. 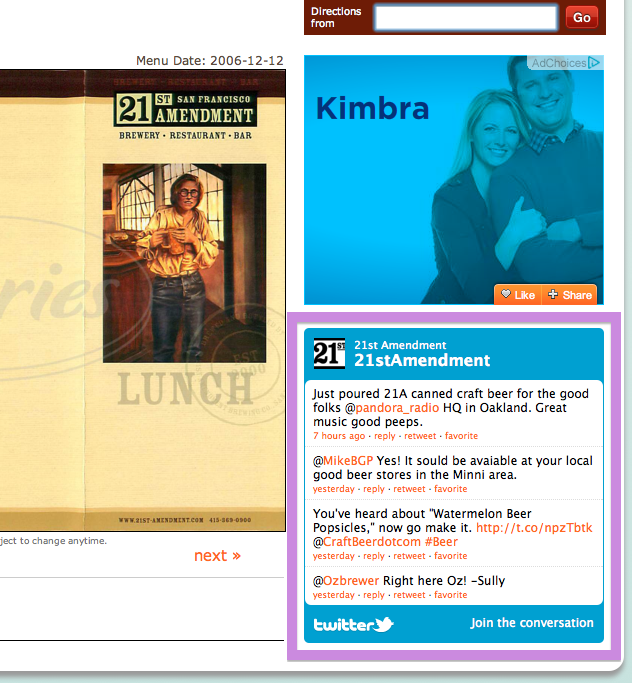 When I first starting working with restaurants on the web, only a small percentage of them even had a website. Now more than 50% of restaurants have a website. Now some are jumping onto twitter, especially with the food trunk craze over the past few years. As another way to makes dineries a better place for all things restaurant, we've added a feature to display the twitter feeds of restaurants. We're planning on integrating the food trunks into dineries and this will come in handy for those as well as seeing other promotions any restaurant may be doing. We think credit is should be supplied where credit is due. At dineries we try to care, unfortunately there are too many things to care about. But giving our users credit is one thing that's important to us. We've been keeping track of who as submitted what, and now we're starting to display them. We are still building a lot of the infrastructure and adding restaurant data, but pretty soon, we'll be adding cool user features like better search and sorting. Anyway, I want to welcome all the sporq users to dineries.com. We hope you like it here and we will try our best to deliver a even better product than sporq. I (andrew) am actually one of the founding members of sporq and now i'm trying to continue on with my vision with my new team. In addition, we have optimized dineries at the core levels and it runs about 4X faster! Enjoy the speed and don't get whiplash. So in our quest to provide the most comprehensive and complete restaurant website. We have started providing restaurant.com gift certificates links to any restaurant features discounted gift certificates there. If you are looking at a restaurant why wouldn't you want to save some money? Read the restriction before you buy though! 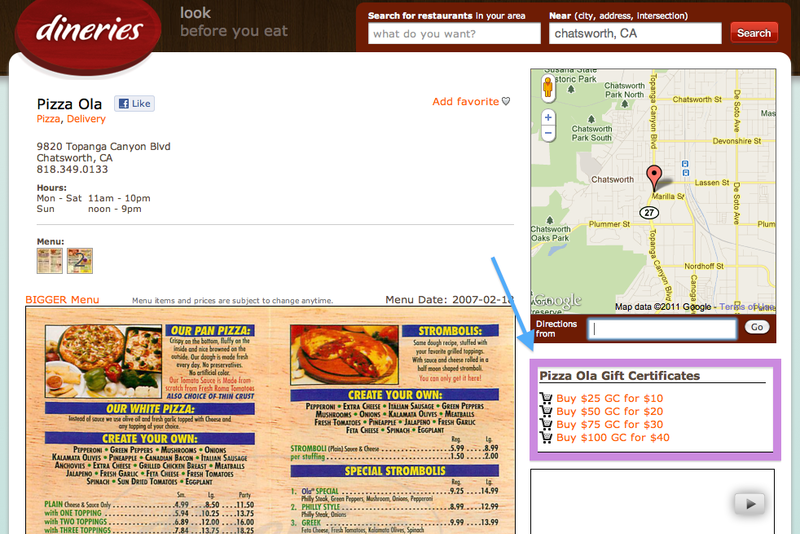 We'll post information about any promotions that restaurant.com is running to save even more money.